Are you dealing with uncertainty in your relationship? I can relate. There was a time in my life where it seemed like I was constantly adjusting to something or impatiently awaiting clarity about my relationship status. Because of this, I wanted to understand more about how myself and others respond to the uncertainty in relationships. Figuring things out helps me cope with uncertainty and anxiety. I realized a refresher course on relationship uncertainty was going to make life easier! I began paying closer attention to my clients that were experiencing extreme uncertainty in their personal and business life. I also reflected on times I have been unsure and listened more closely to loved ones who expressed feelings of uncertainty. What I heard was this: it’s hard to know if it’s better to stick it out or if it’s time to move on. This confusion taps into 2 different concerns: 1. Fear of the unknown and 2. Self doubt. What I came up with was that when faced with doubt our brain relies on what it knows – whether this intel is reliable or not. Your brain uses past experiences, beliefs, current information and sensory data and creates possible outcomes and makes predictions. This is all in an effort to relieve uncertainty in the midst of change. It does this because uncertainty produces one of the highest levels of emotional discomfort. 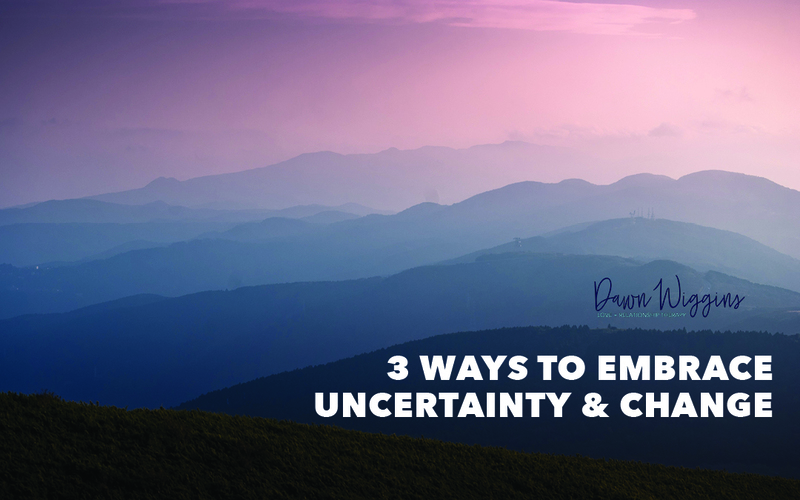 The irony is that uncertainty also provides one of the greatest potentials for personal growth. This is an opportunity to stretch ourselves and learn new behavior and create positive change. Check yourself! In times of uncertainty do you predict negative or positive outcomes? Consider that a large portion of the intel we use to create probabilities is actually not reliable data. It is often based on assumptions, mind reading, unverified observations about other people, hearsay, etc. Face your issue and communicate as clearly as possible. Uncertainty produces stress, so self-care is key. Know when you are at your limit and need a time out, a hug or to talk to someone! And, if you’d like to receive free advice about life, love, and relationships, be sure to opt-in to my newsletter! It’s a convenient approach to add a little therapy into your life. Pertinent article for us all. Thank you for reading and for your feedback. My goal is to make tough topics easier to approach!